Companies overwhelmingly perceive a responsibility to respect human rights. 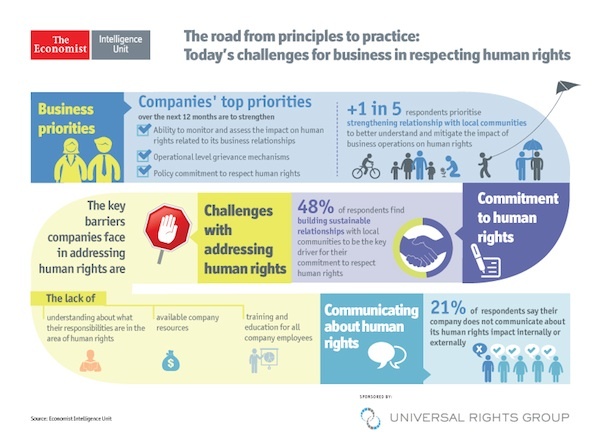 Four-fifths (83%) of respondents say business is an important player in respecting human rights. In each of 11 clusters of human rights, a majority say their companies’ operations have an impact. 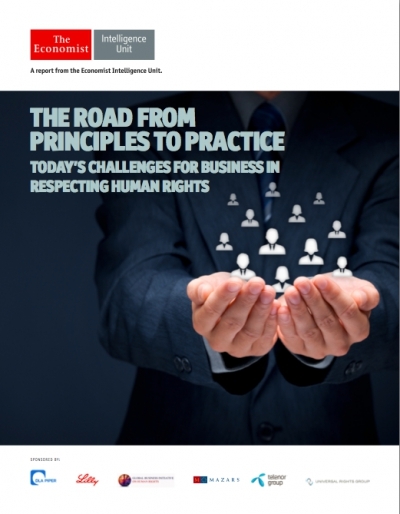 The “business case” for respecting human rights tends to rest on behaving ethically and maintaining good relations with employees and others, rather than on short-term risk management or financial considerations. The main driver is “building sustainable relationships with local communities” (48%). Companies are still learning what their human rights responsibilities mean in practice. While most acknowledge the importance of the issue, 54% have no policy statement referencing human rights, and only 22% have a publicly available statement of policy on this issue. The main barriers to addressing human rights are lack of understanding of responsibilities (30%), lack of resources (27%), and lack of training and education for all employees (25%). Responsibility for respecting human rights tends to be diffused among departments, including corporate social responsibility, human resources, and strategy. Of all corporate functions and levels, CEOs were most likely to take the lead (44%) or to be actively involved (28%) in corporate human rights efforts. Corporate communications on human rights are more internal (42%) than external (27%). About one-fourth (23%) communicate on human rights as part of corporate social responsibility activities, while 21% do not communicate about human rights at all.